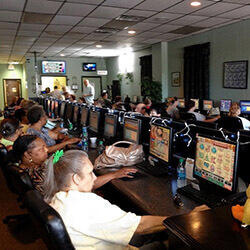 In Kendall County, the Oswego Village Board has once again rejected an idea put forth by a Napierville-based agency to set up a video gambling cafe in the village. The news was first learnt when Wilbur You, owner of You Holdings, came to the Village Board with a business idea. You presented the Board with an idea to set up a gambling cafe, complete with interior and exterior renderings in what he called an, “upscale” gambling cafe with up to five gambling machines. This revised version of his proposal is done in attempt to rectify his plans from earlier this year in March, where You approached the Village Board with his initial idea, but was rejected by the Board. He then decided to try again, having altered the designs for the cafe in a bid to once again sway the decision of the Board. The Board has said that they shot the idea down due to the location of the cafe, which would be too close to both an elementary and high school. Pam Parr, trustee of the board has this to say, “That is one of the entrances to our town. We have been pretty deliberate in where we have allowed specifically gambling parlours and they have been off the beaten path and with a history of not being occupied. You has been reportedly sent back to the drawing board by Village President Gail Johnson, who has been less than thrilled with the idea and saw no reason to more forward with it.